I hope you had an awesome Christmas! Spending time with family and enjoying the time off work is a gift in itself. Here at the McClellan household we enjoyed some great food and fun with family. Santa must have not got the letter I wrote because I did not get that SM57 in my stocking but that's okay, I will let it slide this time. So now a new year is soon to begin and with it comes the usual resolutions that all of us fail to keep. Yep, I am a realist. However, my Pastor said something in service the other day that made total sense. He said that the reason most of us fail to keep those resolutions is because we are holding ourselves accountable. Ergo, when we are the only one to let down its easy to break that commitment. 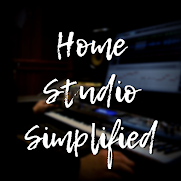 So, I propose that this year, when it comes to the resolutions you will make concerning your studio, ,musical progress, (or anything for that matter) get a buddy you can trust to give you honest feedback and keep you on track! Tell him/her that you want them to stop you dead in your tracks and slap you silly if they have to and say something like "Hey! You said you were going to release an album this year! Get to work!" Even better find a group of like minded individuals that share the same goals and let them know your goals openly. This will place you in the hot seat when you don't fulfill those goals, which in turn will spur you on. Now with anything in life you have to have drive and a passion for your endeavor regardless of what it is or you will not have the want to achieve. This is where the task at hand loses its luster and suddenly becomes a job. Now, that is not to say that at times even our greatest passions become burdensome and frustrating when we don't see the results we are looking for, that is natural. Keep chugging along though and it will pay off in the end. So, for the new year I have a few resolutions to share with you on my part. These are things that are achievable and needed for me to get to that next level in life. Aside from the first thing on my list these are in no particular order. There! I did it! I let it out and now I am accountable at least to those of you lovely people who stop by and read my ramblings every once in awhile. Thank you by the way for those of you who have listened to the podcast, read this blog, commented on or liked my Facebook page, and subscribed to the YouTube Channel. I am just getting my feet wet with all this and am really loving it! Okay, so now to find a few good friends of mine that will hold me accountable face to face and I am all set! I hope you all have an awesome year 2016, God bless each and every one of you!